I came across Oliver Kamm’s article ‘A Parody of Democracy‘ in which the author tries to make the case that political blogs poison debate, rather than enhance it. Kamm is obviously sufficiently keen to avoid debate that it’s not actually possible to comment on his own ‘blog‘. The essence of his argument is that political blogs tend to be bitter, ill informed, and – presumably – other means of political debate are preferable. Yes, there are plenty of nasty sides to political blogging, but the same could be said about any aspect of the traditional media. More importantly, when a little research is done, blogging offers a means of linking up people who care about diverse political issues. Nowhere has the traditional media investigated Gordon Brown’s take on the UK’s EU budget rebate, or analysed why the Tories are hypocritical about open source software. How else could I debate such things if I did not write about them here? Go and find a Habermas-style public sphere somewhere? Yes, take political blogging with a pinch of salt sometimes, but its inherent value is unquestionable in my mind. 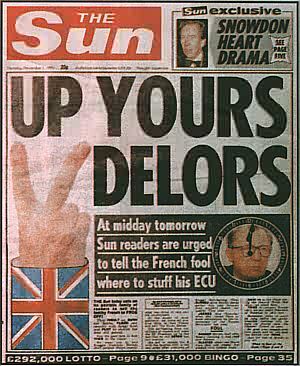 Oh, as if you needed a reminder, I’ve used the famous Sun front page to illustrate the point.